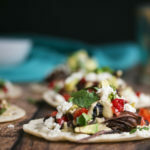 Shredded beef tacos made with tender and spicy beef short ribs slow cooked with tequila and habanero peppers, tomatoes, avocado, cilantro, crumbled cheese and a easy homemade creamy salsa verde. Heat an ovenproof skillet that has a cover to med heat and wait till it gets nice and hot. Don't put in the oil yet. Salt and pepper the ribs liberally then sprinkle the ribs with the garlic powder, chili powder and cumin. Rub the spices in well. Add the oil to the pan when its hot and sear ribs on all sides till they are nicely brown doing only a few at a time. Transfer to plate and repeat till all the ribs are seared (this can take 3-5 mins per side). Add all the ribs back to the pot and then pour the tequila, chicken broth, and water in. Cover and cook for 2 - 4 hours over low heat. Check the ribs after 2 hours and see if they fall apart nicely. If not, recover and cook for another hour. Then check again. Check every hour to see if there is still liquid. If it's looking dry, just add a little liquid. When they are done, remove the ribs from the pan and let them cool a little. Then remove the bones and separate the meat from the big chunks of fat. Shred the meat into bite sized chunks and set aside. Preheat your oven to 375 degrees. Add the tomatillos, onion, jalepenos and garlic to a oven tray or pan. Pour the oil on top and toss well. Sprinkle on the salt and toss again. Bake in the oven for an hour or until roasted and nicely browned. Remove from the oven and let the veggies cool slightly. Pour them into a blender with the sour cream. Blend until the salsa reaches your preferred consistency. We like ours somewhere between chunky and smooth! Add the cilantro and blend slightly or just mix in, depending on if you like big pieces of cilantro or not. Set the salsa aside. Set out a few tortillas. Add the shredded meat first, then the tomatoes, avocado and cheese. Sprinkle with cilantro and drizzle with sauce generously. EAT!